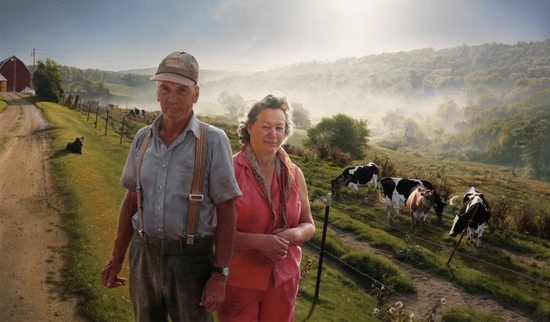 When David Lenz, a realist painter born and based in Wisconsin, was given the chance to create a portrait for the National Portrait Gallery in Washington D.C. he had to consider a limitation that challenged his egalitarian tendencies. The NPG's charter clearly states that it is to collect portraits "depicting men and women who have made significant contributions to the history, development and culture of the people of the United States." For Lenz, who has built his singular reputation by portraying the common folk of Wisconsin, the idea of celebrating an individual who was already a known figure went slightly against his grain. Ultimately, Lenz tried to convince the officials of their gallery to enlarge their definition. "Everyone is important," he argued, and the compromise that followed -- he would paint a portrait of Eunice Kennedy Shriver accompanied by five Special Olympians -- resulted in an unforgettable painting: "Rare Halo Display: A Portrait of Eunice Kennedy Shriver." Brandon Fortune, a curator at the National Portrait Gallery who has looked hard at "Rare Halo" has this to say about Lenz's capabilities: "He (David) has a clear vision of what his paintings will be and how they carry meaning. Also, he is a consummate master of his materials." One of the themes of the completed canvas is that life's apparent limits can dissolve in the presence of personal heroism and divine oversight. Transcending expectations is a recurring theme of Lenz's portraits and also a theme of his life. Acutely sensitive to life's problems and possibilities, Lenz is a realist -- as a man and as an artist -- but also a visionary who carries an innate sense of overarching justice. Lenz grew up in family that was deeply involved in art. His grandfather Nic Lenz was a painter and illustrator and illustrator, and his father Tom -- now a private art dealer -- ran the Lenz Gallery on West Pittsburgh Street in Milwaukee. "There was wonderful American art around," David recalls. "My father had a Norman Rockwell at one point, and I also remember him coming home with four large paintings of animals by Carl Rungius." Inspired by the art in his home, and by visits to his grandfather's studio -- he still remembers the smell of gum spirits -- Lenz decided by the age of 10 that he would be an artist. He had an early success, winning the "Kiddie Corner Art Contest" offered by a local newspaper and winning the first prize of a $10 savings account at First Wisconsin Bank. As an undergraduate at the University of Wisconsin in Milwaukee in the early 80s Lenz majored in Visual Communication -- Illustration and Graphic Design -- when he realized that there was a "big divide" in the art department after being juried out of a student art competition. "Doing representational paintings made me an odd duck," Lenz notes, "doing something that was considered passé and out of date." After graduating Lenz spent four years as an art director and then made the risky decision to become a full-time fine artist. Initially he painted landscapes, set in both Wisconsin and Canada, which have a luminosity reminiscent of Hudson River School paintings. 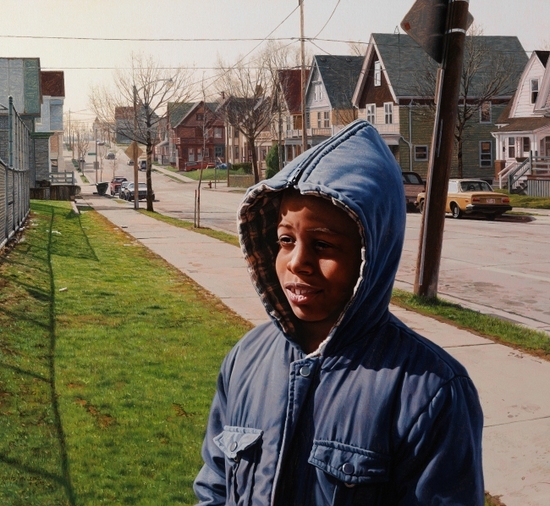 After moving to the east side of Milwaukee the human figure became central to his practice as Lenz painted a number of children set in their urban environments. As these pictures developed, Lenz's ability to empathize with his subjects while also portraying them with unflinching realism became increasingly apparent. In 1997 Lenz and his wife Rosemarie Feiza-Lenz welcomed their son Sam into the world. Sam, who was born with Down syndrome, was the subject of "a few small paintings" as a child, but between 2000 and 2005 Lenz was mainly occupied with a series of paintings of dairy farmers Ervin and Mercedes Wagner. In terms of style, subject matter and setting these paintings are about as far from "New York" as possible, reinforcing Lenz's commitment to painting people and places that he feelings a direct connection with, and also his lack of interest in art world trends. After seeing an announcement in ArtNews for a National Portrait Gallery competition Lenz realized that it was time to paint his son Sam. Lenz dedicated an entire summer to executing the painting, a risky move for a family man whose sole income has always come from his art and who has never been represented by an art dealer. "I'd actually grown discouraged from entering art contests," Lenz later told a reporter. "Realism has been out of fashion my entire career." We own a little piece of land -- near Wagner's farm -- where we pitched a tent and got married on the land. It is a pastoral landscape that serves in the painting as metaphor for Sam's place in the world. The trees have been cut down and the land has been manipulated for farming. In a sense, it is an alteration of the Garden of Eden -- as given by God -- that has been made useful for man. Because of the 'perfection' we prefer -- suburban laws trimmed and sprayed with pesticides, shiny cars with no spots -- we have damaged nature. If the re-shaped landscape of the farmland is a metaphor for the situation of the environment, the barbed wire fence behind Sam -- another man-made element -- is a metaphor for discrimination. "Sam will never fit the definition of what society considers perfect," notes his father. "He will always be his own person, and what is offered by the landscape beyond the fence will always be difficult to reach. " In the finished portrait eight year old Sam peers inquisitively forward while a haloed sun appears over his shoulder. Lenz painted the halo as a "big wonderful graphic element" and also to add a hint of the divine. "I've always loved the idea of halos -- it came from Hudson River paintings -- as a metaphor for God looking down on the earth. The halo reinforces that idea; 'God is looking down on this world. And we can wonder: what does He think of all of this?'" 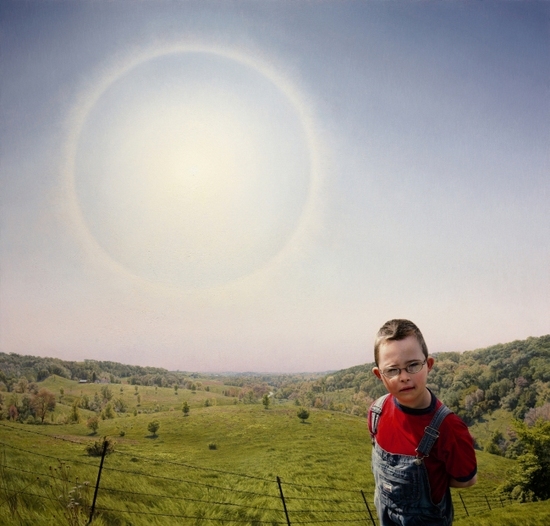 In June of 2006 "Sam and the Perfect World" was awarded first prize in the Outwin Boochever Portrait Competition, beating out nearly 4,000 other entries. David Lenz received a $25,000 cash prize and also the commission to paint a "remarkable American" that would result in the Shriver portrait. In a sense, "Rare Halo Display: A Portrait of Eunice Kennedy Shriver" continues and extends some of the themes of Sam's portrait. Painting portraits of people with intellectual disabilities has become what Lenz thinks of as the "third leg of the stool" in terms of his subject matter, and the fact that Sam has participated in the Special Olympics made Eunice Shriver -- the program's founder -- an appealing subject for his commission. "I went to meet Shriver in 2007," says Lenz, " and we spoke for about 45 minutes. She wasn't particularly interested in being in the spotlight, but the idea of sharing it with five Special Olympic athletes seemed natural to her. " As he considered Shriver's life and achievements, Lenz found a great deal to admire. She worked for five decades to improve the life of people with disabilities and had started when nobody else was talking about it. After her sister Rosemary, who had a mild intellectual disability, went through a lobotomy that left her incapacitated, Eunice pushed the family to talk about her sister. She wrote an article in the Saturday Evening Post, which made her sister's condition public knowledge. And she started a civil rights movement on behave of all people with intellectual disabilities. 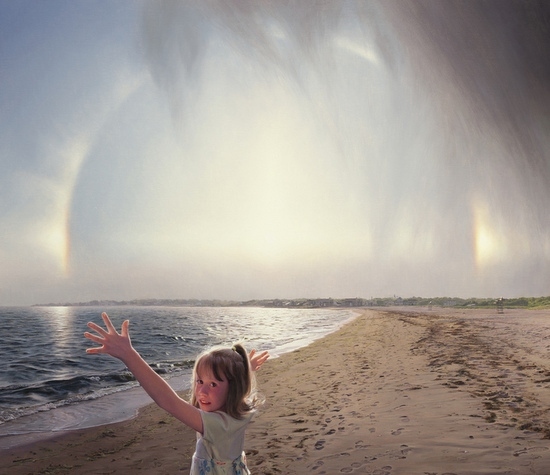 Detail: "Rare Halo Display: A Portrait of Eunice Kennedy Shriver"
For the setting of his painting, Lenz depicted Shriver on the beach near her Cape Cod, Massachusetts home. She is joined by four Special Olympics athletes and a Best Buddies Ambassador: Airika Straka of Wisconsin Rapids, Wisconsin, Katie Meade of Des Moines, Iowa; Andy Leonard of Reynoldsburg, Ohio, Loretta Claiborne of York, Pennsylvania and Marty Sheets of Greensboro, North Carolina. Behind them, the sun is setting and a halo similar to the one which appeared in the portrait of Sam appears. As Lenz explains: "If you look carefully you will see two bright dots -- sun dogs -- and a pillar of light. When you connect those there is a cross in the sky. It is there as a metaphor for Shriver's life and work." Of course, the painting isn't just about Shriver: it is also about those who she helped lift up. 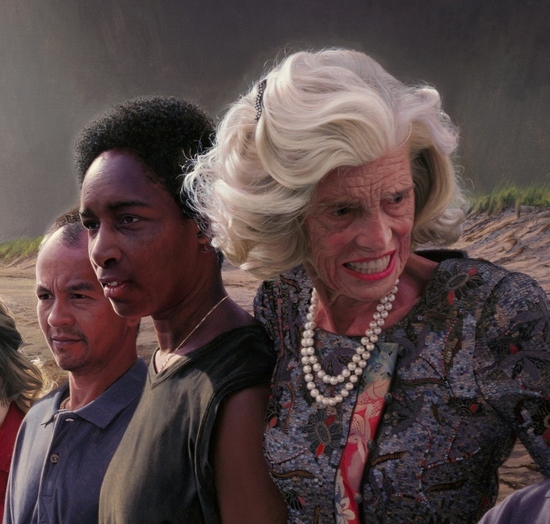 Speaking about the individuals who join Shriver in the painting Lenz notes that "They would never normally make it onto the wall of the National Portrait Gallery. But, after the unveiling there were so many inquiries about them that a secondary label was added." "There they are," Lenz says with pride, "as big as life." Since the painting is a tribute to the vitality and humanity of subjects, making them "larger than life" wasn't necessary. Lenz realized that they were already perfect, and just painted what he saw.